But in The Small-Mart Revolution, Michael Shuman shows that the benefits these mega-stores and huge corporations supposedly deliver to communities are illusory. Crunch the numbers and you&apos;ll find that locally owned businesses turn out to be much more reliable generators of good jobs, economic growth, tax dollars, community wealth, charitable contributions, social stability, and political participation. Unlike their global competitors, they do this without massive tax breaks and subsidies that often put local economies in a permanent hole. Plus, contrary to popular belief, local businesses are competitive with the multinationals--and gaining ground every day. Shuman highlights numerous trends that are making the old "bigger is better" economies of scale argument obsolete, and he describes a variety of innovative strategies these businesses are using to successfully compete with their over-sized competitors. He also shows how consumers, investors, and policymakers can support their own communities by "going local." 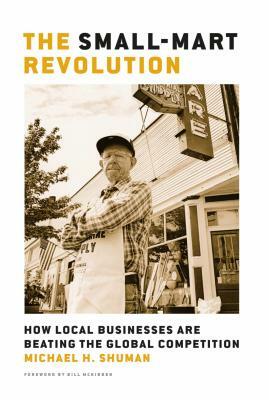 The Small-Mart Revolution offers a robust alternative to "go-go" globalization, one that nurtures the creative capacities of local businesses and enables communities everywhere to thrive.